103 on a quilt I am making and got my things ready to wear to the party tonight. It looked very much like rain when we began to get ready. But we hurried of over there. It stormed terribly and we had to stay all night. But had a splendid time. I dont know when I have enjoyed myself so well. There was quite a number there. 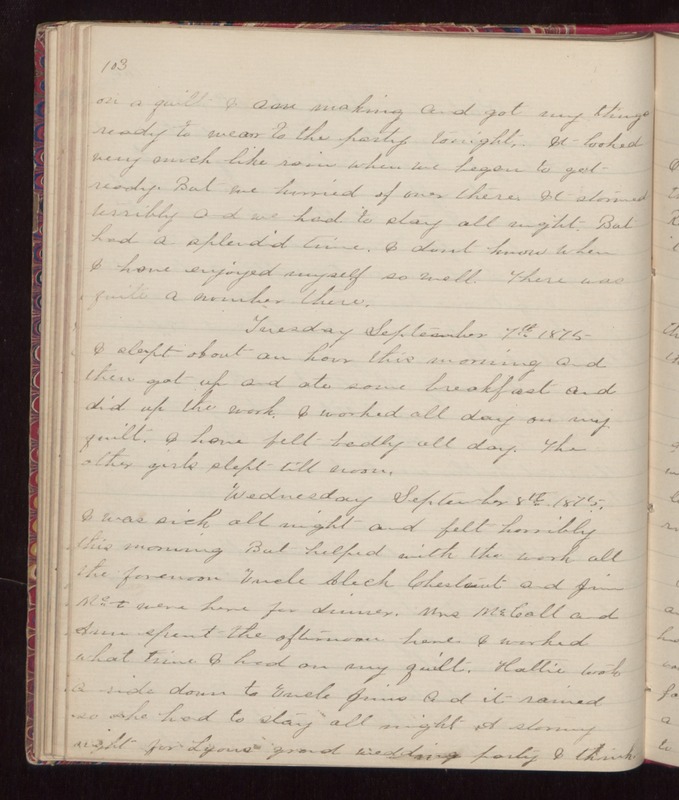 Tuesday September 7th 1875. I slept about an hour this morning and then got up and ate some breakfast and did up the work. I worked all day on my quilt. I have felt badly all day. The other girls slept till noon. Wednesday September 8th 1875. I was sick all night and felt horribly this morning But helped with the work all the forenoon Uncle Aleck Chestnut and Jim Mc_ were here for dinner. Mrs McCall and Ann spent the afternoon here. I worked what time I had on my quilt. Hattie took a ride down to Uncle Jims and it rained so she had to stay all night. A stormy night for Lyons grand wedding party I think.